"Oh, I've been around the block," Regina said with a mischievous snicker, "and in more ways the one. You can print that." I knew then that it would be a great interview. We were sitting in Cafe Steam. Me with my Americano. She with her...well, I don't remember what she was drinking, but it was in a cup. Her two young children sat at the table next to us and throughout the interview I was impressed by how well they entertained themselves while we talked. Her thick Philly accent gave her words a hard edge, but a warm, hearty laugh assured me she had a softer side, too. I asked where she was from (Philadelphia, of course) and how she ended up in Rochester. "My husband," she said. "He's a project manager in IT at Mayo." "What about your background?" I asked. She earned her undergraduate degree in American Studies with a minor in history from Penn State. "My plan upon graduating was to join the INS - which is now the Department of Homeland Security - to be a border patrol agent. I made it through the written exam, but during the physical exam they noticed something wrong with my eyes." She went to a specialist and two weeks after her graduation she was diagnosed with with Stargardt Disease which is a form of juvenile macular degeneration. "So, I was like 'I really can't be in a position where I carry a gun. This ain't gonna work out.'" Within two years of diagnosis she reached legal blindness which is defined as 20/200 vision. 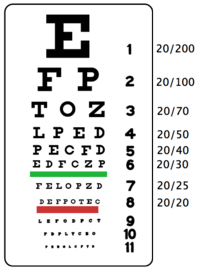 That means if you were to stand 20 feet away from an eye chart you would only be able to see the top letter - the really, really huge one. The Stargardts diagnosis effectively ended her goal of working with the INS, "So," she said, "I had heard about these teaching opportunities abroad for native English speaking people in Seoul, South Korea. I looked it up and in August of the year I graduated, I moved to Seoul and taught for a year. Didn't know anyone. I then spent a month in Rome, but Rome proved to be way more expensive than Seoul, so I taught for another year in South Korea." "Had you met your husband at this point." I asked. "After I came back from Soul." "How'd you meet your husband?" "Was it love at first sight? Or did it happen slowly?" Regina's mouth crept up in a half smile. "Yeah," she said. "Thirteen years later and I'm still trying to figure that out." There came that warm, hearty laugh again. "Does he know that?" I asked joining in her laugher. "Okay. Good." Honesty suited her, for sure. And, since we opened that honest door I dug a little deeper. "At what age did you feel like an adult?" "Oh my! That's a great question!" She exclaimed and after she gave herself time to think about it she said, "Well, looking back in hindsight..."
"That's the only way you can look back," I interjected. She continued while I laughed at myself, my little joke going unnoticed. "Of course when you graduate from college you think you know everything. And then, even form like 22 to 28 you think you know everything." She paused again. "It wasn't until I went to South Korea where I didn't know a single damn person or very little about the culture that I learned so much about myself. The shock of it, uh, yeah. That was a major growing up moment." Then Regina moved into familiar territory - at least, to me. "I would say the other major time where I felt like an adult is when I had my son. Yeah. I didn't have any younger siblings and I never babysat. I took the classes and talked to other young parents, but nothing prepared me for when I had that first kid." "That was my experience, too." I said before moving to the next question. "Imagine yourself as your 8-year old self." "What's the first thing that just popped into you head?" "Watching TV," she said definitively. "The TV was always on at my house. Even if no one was watching. Now, thanks to my husband's influence, we don't have a TV in the living room and we have no cable." We talked about TV shows we watched as a kid: Rainbow Bright, Care Bears and My Little Pony. Ah...those were the days. "Describe a time when having a strong personality did not serve you well," I asked explaining how it is I could assume she has a strong personality in the first place. You see Regina has taken up residence in places where she is most definitely needed, but not necessarily welcomed. A legally blind Muslim woman who takes part in local politics and is active in her community especially in her advocacy for minorities takes a certain chutzpah in today's American life, so it seemed a fair bet that she'd have a strong personality. After thinking on in a moment, Regina shared the story of a friend of a friend who was considering marriage to a man who Regina felt was not being totally up front with this woman. In essence he seemed to be a scuzzball. "So, I sit down with this woman," Regan said, "and I came off too strong and ended up hurting her feelings. She was in tears and left. I should have been more cognizant of her feelings. There was a more gentler way." "So you didn't accomplish what you set out to accomplish," I clarified, "and your own personality got in the way of doing what you wanted to do?" "Yeah. I ended up apologizing the next day." "And how did she receive that?" "Eh," she said with a shrug only those on the East Coast have perfected, "they got married." But, it turns out Regina was right about the guy as the couple ended up separating. "I learned my lesson though because my intention wasn't to hurt her, but I thought I needed to be harsh to save her from being played by this guy. It was a humbling experience." "What do you think it is within you that drives you to advocate for someone...that part of you that wants justice or for things to be set right?" I asked. Regina was very quiet when she finally answered. "I'm a survivor of sexual assault." I had to lean in to hear what she was saying as she continued speaking about her experience. I assumed she was speaking quietly so her kids at the next table wouldn't hear. "I don't wanna come off as this 'poor me."' she said more boldly as she shifted from speaking about sexual assault. "I mean I know I have a ton of privilege, but being a religious minority, knowing what its like to have a disability, and being a survivor I know what its like to really have to fight for something." "Speaking of being legally blind, you had children after you lost your central vision, correct?" I asked. "Changing a diaper would have to be almost impossible!" "Yeah. Very close." She laughed. "Raising children while being legally blind is a huge accomplishment in and of itself," I said with genuine awe. "Yeah. It is. Now that the kids are a little older it's a little easier." "What's a typical day look like for you in terms of your sight and doing life?" I asked. "Well, I make sure the kitchen is in relative order before I start my day. And these days I usually start the day by asking what needs to get done for the campaign or where I need to go or what I have to read up on? Then, how's the social media presence? What's the state of Muslims? Like a lot of women I have a thousand things going on." Regina listening to an opponent in a primary debate with other Rochester, MN mayoral candidates. Earlier this year, Regina became a candidate in the Rochester (MN) mayoral race. When I interviewed her she was in the thick of getting ready for the primary election. Unfortunately, she (narrowly) came in third place in the primary and as such won't be on the ballot in November. "All that is fine and good, but honestly, how do you apply your makeup so well?" I asked. "I'm a sighted person and I can't apply my makeup nearly as well?" Okay maybe that's a lame question to ask someone as legit as Regina, but I was, at least, sincere in the asking. "I don't give out all my secrets." She gave me a playfully smug look before filling me in on the details of her makeup routine. Apparently, she gets asked that question a lot. Then, she got quiet again. "I could go on and on about my makeup issues and vanity and low self-esteem." Her words followed in rapid fire succession. "It's sheer vanity. It's my sin. It's my sin. My obsession with makeup. It's my sin. I'm guilty as God is my witness. I'm guilty." I felt like I was a priest listening to confession. Of course, that's wrong on so many levels, but there we were nonetheless. "Since you mentioned it, tell me about low-self esteem." I said. "Low self-esteem." She drummed her fingers on the table. "Uh, I think it stems from childhood. Always being the tallest kid in my class with freckles. I mean I had the most god-awful haircut, horribly crooked teeth, and you know those experience in your formative years never quite go away. And, the vision impairment doesn't help." All I could think was if someone like Regina has low self-esteem then we have a lot of work left to do in building up and encouraging one another. "I think you're beautiful by the way," I said. "You're a beautiful woman inside and out." And, I meant it. "Thank you. I appreciate that. You're sweet." Here comes the part where I make a confession. Well, not that sort of confession. But, one of the reasons I asked Regina for an interview is because even though she is Muslim and I am Christian we both share a deep and abiding commitment to our respective faiths that compel us to love and action. For that reason, I wanted to include questions that touched on faith. As I would any other person, I suppose. So, I launched off the religious diving board with "What is one thing that Muslims and Christians share in common?" Her answer came quickly as if she'd answered it before. "Tell me about that," I quiried further. "Oh, we see Jesus as a prophet. He's a tremendous example of God's love, God's peace - a very revolutionary figure for his time as was the prophet Mohammed. We have tremendous example there [in Jesus]. And, yes, of course, the Muslim and the Christian believe in the nature of Jesus differently, but we definitely share a mutual respect. You would never see a Muslim trying to, let's say, do a cartoon of the prophet Jesus. That would be against our religion." "Describe what faith means to you." "Faith to me means...well...you know everything that I love, everything that has meaning for me, everything that I enjoy in this world - even my possessions, even the people that I love - it could all be taken from me which would be the worst, right? The worst. But if I still believe in God and in his justice then there's really nothing to worry about. Because its all temporal. That's faith. That realization may not always be easy to remember when times get rough but I would hope I'd be prepared if the worst were to happen." Dotted throughout the interview were moments I caught glimpses of how faith impacts, and even defines, Regina's life. For instance, she mentioned at one point that, for her, success was doing that which pleases God. She could be dirt poor, but rich in spirit if she only did this. Of course, we disagree on the fundamentals of faith (because they are different otherwise they'd be the same), but in many regards, she and I can have familiar and similar sounding conversations and learn from one another what it means to be neighbors and even friends. At the conclusion of our interview, Regina and her kids packed up and headed out to swim lessons. I left wondering how it is Regina manages so well not only as a legally blind person, but a legally blind mom with two kids and no car. Life is crazy enough trying to get kids from one place to another let alone having to depend on public transportation or one's feet. And, really at this point, in both her life and mine, the amount of time spent transporting kids from one place to another represents much of the sand in the hour glass. You can find Regina in various places. She hosts a near-monthly faith talk show, is the founder of Community Interfaith Dialogue on Islam and is vice chair of the Olmsted County Human Rights Commission. I can imagine that the loss in the mayoral race was hard for her, but based on what I know of Regina it'll be just one part of her ever expanding story. If you'd like to get to know her better, here's a great place to start: from Sandbox Cooperative. Oh, and you'll probably catch her at Cafe Steam next time you're there. Order coffee: strong.